FiDA Failed Implant Device Alliance: When is a Law Firm a conflicted and tax-deductible Lobbyist for Public Federal Policy? When is a Law Firm a conflicted and tax-deductible Lobbyist for Public Federal Policy? How Large are the Public-Policy Practices Within Law Firms? Today we published our annual survey on public-policy practices in Washington, the Influence 50. One of our most surprising results was the number of law firms that counted almost $100 million or more in revenue from work intended to influence federal policy. It was hard to compare these numbers to previous Influence 50 survey results, because of the way firms have changed their thinking and a shift in emphasis in our end to a more holistic measurement than congressional and the Justice Department lobbying disclosures. So we can compare this year’s public-policy revenue numbers to another collection of revenue totals that exists: the Am Law 100 and Am Law 200. Almost every law firm on this year’s Influence 50 is an Am Law 100 or Am Law 200 firm, and thus The American Lawyer has reported each firm’s gross revenues for 2014. It’s no surprise that the firms with the highest totals of public-policy work last year also measure as significant practices within their firms. Covington & Burling’s $99.89 million in public-policy revenue accounted for 14 percent of the firm’s gross revenue in 2014. 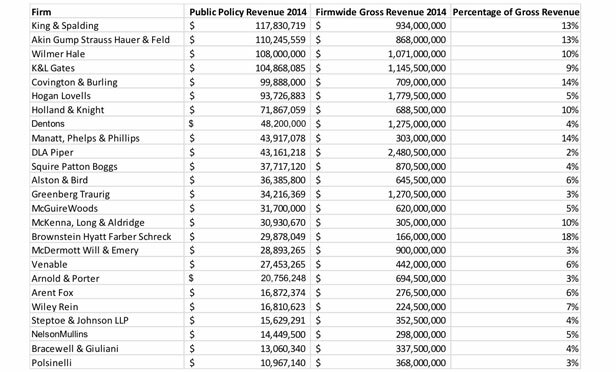 King & Spalding and Akin Gump Strauss Hauer & Feld, our first- and second-largest public-policy practices in 2014, both saw their public-policy revenue reach 13 percent of firmwide gross revenue last year. The firm with the largest proportion of public-policy and lobbying revenue was Brownstein Hyatt Farber Schreck, the 162nd largest national law firm in gross revenue for 2014 according to the Am Law rankings. The firm keeps its growing public-policy practice in Washington fairly separate from its general-service legal operation based in Denver. The Am Law firm with the smallest proportional public policy practice was DLA Piper, a more than 3,500-lawyer operation that is structured as a global verein firm, with many more associated offices around the world compared to a traditional law firm partnership. 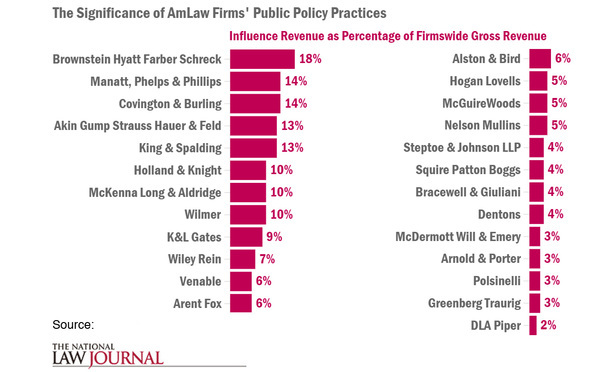 The chart below shows how much the 25 large law firms on this year’s Influence 50 emphasize their public-policy practices. Read the full NLJ story here about how lobbying practices are structured within law firms. And view the Influence 50 chart here. It's a complex influence world. Lobbyists aren't just creatures of Capitol Hill. 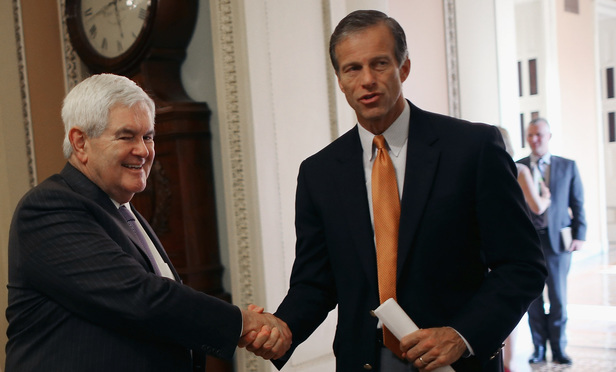 SHAKE: Dentons’ Newt Gingrich, the former House speaker, greets Sen. John Thune. Lobbyist Darrell Conner of K&L Gates likens a Washington public-policy practice to a three-dimensional chessboard, part of a daily mental challenge born decades ago from a grand vision of the lobbying game. But over the past few years, that chessboard has expanded even beyond its own dimensions. "It's a much more sophisticated business in which we operate," Conner told The National Law Journal. The NLJ's annual Influence 50 ranking, included in this edition, attempts to capture the third dimension of lobbying: the part of the practice that's never publicly reported. Most firms self-report to the NLJ their public-policy group revenue totals. Four law firms said they took in $100 million or more for public-policy work — Akin Gump Strauss Hauer & Feld; K&L Gates; Wilmer Cutler Pickering Hale and Dorr; and Atlanta-based firm King & Spalding, which reported the most public-policy business in 2014. King & Spalding's $117.8 million topped our chart of 50 firms. That revenue includes $4.45 million in traditional lobbying work disclosed to Congress and through the Foreign Agents Registration Act. The firm described another $113.4 million as other public-policy business that includes about a dozen different types of influence tasks such as strategic consulting, public relations, grassroots organizing, political law and state attorneys general lobbying. The firm said it does the largest amount of its public-policy work in government investigations, an "area of focus" that brings in lawyers and lobbyists from across several different traditional practices, according to Tom Spulak, chairman of the firm's government advocacy and public-policy practice group. "The thing I don't think people appreciate is the size and the breadth of King & Spalding's Washington office," Spulak said. "People say we're an Atlanta firm. But this is a big office, and all of the focus is on the government." King & Spalding reported almost $43 million in public-policy revenue to the NLJ for this survey last year. That's partly because our survey has changed. This year, we asked firms to measure their influence work more broadly so it focuses more on their nonlitigation regulatory activities. Some firms have redrawn and expanded in recent years their public-policy departments to commingle lobbyists, litigators and regulatory lawyers. Regardless of how a firm defines the work, our survey results show there's a growing hidden world of influence that sweeps in millions of dollars each year for law firms and for many of the largest lobby shops. The lawyers and lobbyists who make this money still represent clients' political points of view and still, in essence, lobby. But they count the work separately from what federal disclosure laws require they report to Congress quarterly as so-called LDA numbers, or information published under the Lobbying Disclosure Act of 1995. According to our data, corporate and private clients bought more than $1.5 billion of public-policy influence services from the 50 top law firms and lobbying organizations last year. Of that revenue, firms disclosed 35 percent to Congress. That portion represents the traditional pound-the-pavement legislative advocacy on Capitol Hill and before some political appointees that results in quarterly filings. Fifteen law firms said their largest sources of public-policy revenue came from other approaches that don't require disclosures to Congress. This type of work often still relies on the skills of lobbyist-lawyers to petition, persuade and build support. The lawyers instead focus on nonlegislative branches of government, such as agencies, commissions and executive branch departments. "In congressional lobbying, the work is done when the bill is signed," said Micah Green, co-chairman of Steptoe & Johnson LLP's government-affairs and public-policy group. 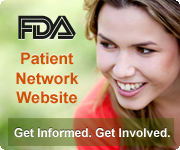 "We keep the Hill informed and link the regulatory, the compliance, the litigation. It's a continuum of services." Firms, especially law firms, put much of their influence power toward regulatory policy. And large firms, such as Den­tons, Covington & Burling, and Wilmer, say clients have clamored for more of the influence service known to some in Big Law as "law-plus." "When we ask [clients] what their most significant challenge is [in hiring professional services], a few years ago they would say talent, value, the quality of providers. Now they say a shifting regulatory environment," Elliott Portnoy, chief executive officer of Dentons, said. The approach isn't new, however; it's just marketed differently. Regulatory law practices have "always been there … since Louis Brandeis was on the Supreme Court," said Ivan Adler, a Northern Vir­ginia-based headhunter who specializes in placing lobbyists at firms. "The reason these law firms are in Washington is that." The slowdown of legislation out of Congress has caused more lobbyists to focus their skills on executive branch players, ­several lobbyists at law firms said. Sometimes the lobbyists will generate support for regulations through grassroots strategy and social media. Other times they'll submit comments to agencies on regulatory proposals and lobby departments and commissions, which can trigger some public lobbying disclosures to Congress. Besides traditional lobbying and regulatory law, Dentons, for example, offers to clients advocates who focus on state attorneys general investigations, congressional investigations and crisis communications, among other public-policy services. Part of Dentons' draw relies on its high-profile hires. This year, it recruited former House Speaker Newt Gingrich as a "thought leader" and "strategic adviser," Portnoy said, and former Demo­cratic National Committee chairman and Vermont Gov. Howard Dean. 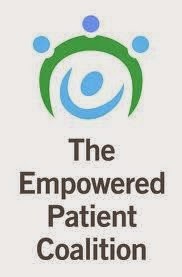 a specialist in health care. The leader of the postmerger firm's public-policy group, Gordon Giffin, is the former U.S. ambassador to Canada. Neither Gingrich, Dean nor Giffin have registered as congressional lobbyists in recent years, an approach to political services that's become more desirable for former members of Con­gress. Giffin likened his firm's practice to a grocery store that offers many choices to clients, and he compared nonlawyer lobby shops to a bodegas. "Nobody says, 'I have a lobbying problem.' They have a problem," Giffin said. "Lobbying can be one of the things that is part of the solution." He continued, as if pitching to a client: "Don't tell me what the solution is, tell me what the problem is. I'm in the business of dealing with government." Covington, the largest law firm in Washington by head count, finds only a small portion of its influence revenue in registered lobbying. Last year, the firm made $12 million lobbying, according to congressional disclosures. But it reached almost $100 million in revenue from other public-policy practices such as government investigations and political law. The firm is among the most ­traditional white-shoe law firms in the city, but even Covington has worked on advancing its lobbying brand. Dan Bryant, a former PepsiCo Inc. vice president, joined Covington in 2012 and raised the group's profile with hires from the Hill and by offering more frequent commentary on lobbying results to media outlets. Bryant left this month for the top government-relations job at Wal-Mart. The public-policy group's next head, law partner John Veroneau, is a former deputy U.S. trade representative, current co-chairman of Covington's international trade and finance groups and a registered lobbyist. The group's additions in the past two years include former Ari­zona Republican Sen. Jon Kyl as senior of counsel and former Rep. Howard Berman, D-California, as senior adviser. Covington senior counsel Stuart Eizen­stat, former European Union ambassador and veteran of several past Democratic presidential administrations, describes the public-policy approach in simpler terms. The firm's vision, he said, was to create a "mini-State Department" to collect outgoing influential government personnel and use them to negotiate in clients' favors. The international work may not necessitate public disclosures, but it uses the same tactics, he said. "This is lobbying. 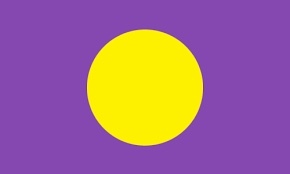 That's what this is. That's exactly what it is," Eizenstat said. Akin Gump's lobbying head, Donald Pongrace, described his firm's policy-planning approach as much broader than what any quarterly lobbying report would capture. Recently, the firm completed a seven-year effort for the Gila River Indian Community in Arizona, a perennial multimillion-dollar lobbying client. The work involved a legislative agenda as well as litigation settlement negotiations over water rights. These are major legal and political strategy undertakings, with diagrams, brain storms and white board sessions at the firm. "Our job is not to be the people who have the relationships per se," Pongrace said. "What we can do is fight the war on multiple fronts." Lobbyists within law firms sometimes look down at competitors at lobby shops, the smaller nonlawyer operations. One lobbyist at a law firm described the lobbying groups that populate smaller gross revenue levels as "three guys, a computer and a cellphone, sitting in Star­bucks." Several others describe nonlawyer lobbyists as people who know people on the Hill, but whose value ages as congressional staffs and members turn over. Representatives of several lobby shops on the Influence 50 contradict that. The three-decade-old Podesta Group, with $45 million in revenue last year and 49 professionals, makes most of its money in congressional lobbying, then public relations. Nonlawyer companies BGR Government Affairs, Van Scoyoc Associates and Capitol Counsel also ranked among our list's top 25 public-policy firms. Many nonlawyer public-policy businesses have obvious benefits compared to Big Law: fewer secretaries, no associates, smaller offices, no requirements to count hours for billing purposes. Lobby shop personnel pocket more of every dollar they earn compared to law firms. "Law firms are selling hours. We're selling understanding, smarts, relationships," said Marc Lampkin, co-head of Brownstein Hyatt Farber Schreck's Wash­ington office. The law office is structured more like a traditional small lobby shop, with almost all of its income coming from publicly disclosed congressional work. Kirk Blalock, of Fierce Government Relations in Metro Center, said lobby shops like his were happy to keep the operations rooted in congressional lobbying. "We stick to our knitting," he said. In a way, the law firms do, too. Clients are happy to see most of the money they pay public-policy groups going toward legal services, which are tax-deductible unlike lobbying expenses, law firm leaders say. Yet they still want their law firms to offer some lobbying capabilities. Take it from Steve Ryan, head of McDermott Will & Emery's public-policy practice. About one-sixth of the group's $28.9 million gross revenue came from congressional lobbying last year. "My government strategies [group] is a tail on the firm and not the dog. We're a very happy tail, and we wag it a lot," Ryan said. Contact Katelyn Polantz at kpolantz@alm.com.